[Filler] Exam day is fast approaching, and everyone at the Academy begins preparing for them. Repeating a grade is a possibility if you fail a test. Denki, who lacks skills in ninjutsu, is having a hard time using chakra to climb walls. And as usual, Iwabe can't wrap his head around what he's studying. 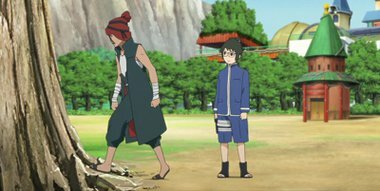 Boruto and the others try to help them train and study, but end up making things more confusing for the two. Will Denki and Iwabe avoid being held back?